A’Than, the call to prayer, is recited five times daily at the prescribed prayer times. Customarily, the call is made by a person who has a strong, and melodious voice (the Mu’a’then) to summon the Muslims for their mandatory prayers. The Mu’a’then stands on an elevated ground (e.g. the minaret of the Mosque) and faces the direction of the Qibla (the Kaaba in Makkah) to make the call. The Mu’a’then turns to the right and the left while reciting parts of the call. A few minutes later, a similar call with slightly altered wording (Iqama) is made inside the Mosque, after which, people assemble in lines ready to commence their congregational prayer. People praying outside the mosque also recite both the A’Than and Iqama for each of their five daily prayers. Mosques today are equipped with loud speakers mounted on the minarets and the Mu’a’then makes the call from inside the Mosque. Also, with advances in IT and computers, watches, clocks, cell phones, and computers have A’Than recordings that come on at prayer scheduled times. History: With the conclusion of the construction of the Prophet’s Mosque in Madinah, Prophet Muhammad (pbuh) consulted with his companions regarding summoning the Muslims to gather for prayers and important meetings in the Mosque. Several options were discussed but none were found appealing. A few days later two of the prophet’s companions (independently) related to the prophet their visions in which the wording of the A’Than was used to call people to the prayer. The prophet acknowledged their visions as inspirations from God and assigned Bilal to become the first Mu’a’then in Islam. Bilal, a freed slave from Abyssinia and one of the early Muslims, was chosen because he had the best vocals. Since then, A’Than continues to be recited by Mu’a’thens and all Muslims around the globe in the same words in Arabic exactly as it was recited 14 centuries ago. Significance: In addition to alerting Muslims to prayer times, the A’Than creates a spiritual primer to the Muslims and sets the stage for piety in their prayers. The words of the A’Than are but an easily intelligible summary of Islamic belief. It brings to the mind the substance of Islamic spiritual ideology as it reiterates the testimony of faith, calls the Muslim to success and emphasizes the greatness of the Creator. The A’Than is also the very first thing a newborn Muslim hears. 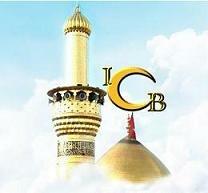 The Islamic tradition is to recite (whisper) the A’Than into the newborn’s right ear and recite the Iqama in the left. It is a blessing for the newborn as well as an initiation for his/her spiritual attachments to Allah. 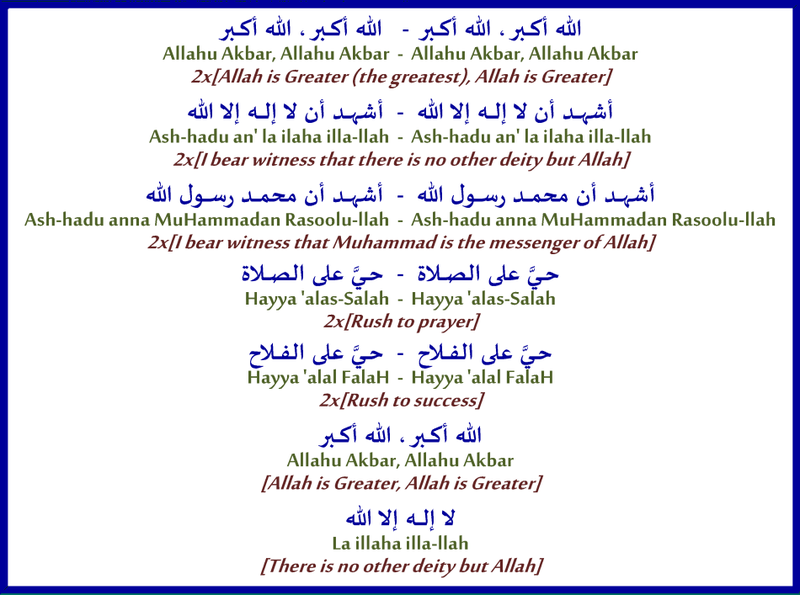 Allah is Greater: The words “Allah is Greater” has the powerful meaning to the Muslim throughout his/her entire life. Allah is indeed greater than all there is, all we could imagine, and all that is there that we can-not imagine. This is what the Muslim truly believes in; that Allah is greater than the challenges we face, the tests we go through, and all our needs. Allah’s Mercy is greater than all our sins, His Wisdom is greater than all knowledge, and His Power is greater than all other might. Hence, at this very moment as Muslims hear the call to prayer, the invitation to have this special session with Him, the opportunity to be present in His welcome, their utmost priority and dedication should be - and without hesitation or tardiness –to engage piously in their prayer to Him. I bear witness that there is no other deity but Allah - I bear witness that Muhammad is the messenger of Allah: This is an iteration of the Muslim Testimony of faith… The first part is an acknowledgment of the Muslim’s total submission to and acceptance of Allah and His will. The second part is an acknowledgment of Prophet Muhammad as a messenger of Allah. This inherently implies accepting the Message that he preached; the message of Islam, and the book of Allah (the Quran). Muslims believe that Muhammad (pbuh) is the seal of the prophets commissioned by Allah to deliver the final and comprehensive message of Islam; following a chain of prophets and messengers from Allah that started with Adam (pbuh). Islam acknowledges the messages of Abraham, Moses, and Jesus (pbut), to name just a few. The urging word in “Rush to prayer” and “Rush to success” in Arabic (Hayya) is in fact a derivative of the word “life”. A more accurate translation would have been “revive your life” by rushing to the prayer; thus depicting the prayer as the source of life for the Muslim. The later part is an association of prayer with success as it truly sets the tone and attitude of the Muslim’s life as thus becomes the most critical ‘spine/column’ that supports the Muslim and guides his/her success. It is worthy to add that in the early morning (Dawn) A’Than the words of “الصلاة خير من النوم – Assalatu Khayrun mina-nawm - Prayer is better than sleep” are iterated twice right after the rush to success segment.